"Page 2- First Problems - SURE Aeros Intakes"
"The first set of problems came in January 2011, when the aeros line of intakes were released." The original model Aeros Intake System (SURE0100) was released in November, 2010. The current model of the Aeros Intake System (SURE0113) was released in April, 2011. There have been several revisions to both SURE0100 (discontinued) and SURE0113 (current model) Aeros Intake Systems. (a) The SURE0100 MAF (Mass Air Flow) housings did not have an o-ring between the MAF housing and the MAF sensor mounting plate. This was not published as a warranty issue. The few affected customers were sent replacement components at no expense to them. (b) The SURE0100 MAF housing's sensor location had an inside diameter of 1.250''. This diameter was adjusted to 1.229’’. This was not published as a warranty issue. The few affected customers were sent replacement components at no expense to them. (c) the SURE0100 (discontinued) Aeros intake system may result in high fuel trims and a Check Engine Light (CEL) on select 2010 Mazdaspeed 3 vehicles. The release of the 2010 Mazdaspeed 3 included new fuel trim values for the Check Engine Light (CEL) threshold. This change infrequently resulted in a CEL with the use of SURE0100 (discontinued), more commonly when used in colder climates. Not all 2010 Mazdaspeed 3 experienced this CEL. SURE Motorsports upgraded affected 2010 Mazdaspeed 3 vehicle owners to the new Aeros Intake System System (SURE0113 - Current Model) at no expense to them. This was published as a warranty issue and can be found at SUREHQ.com. "Ive been doing my own independent testing.. Genpu's with stock airbox are hitting trims in the 7% area.. This isnt your intakes fault.. its not [name redacted]'s either.. this is a Mazda problem that needs to be addressed via firmware update Cullen." "There were some issues with the MAF housings causing un-metered air to get by, causing some piss poor idle conditions and backfiring. This was due to the housing not sealing to the meter properly." (a, b) Several SURE Motorsports Aeros MAF housings were shipped without an o-ring between the MAF housing and the MAF sensor mounting plate or an incorrect MAF sensor location diameter. This allowed for unmetered air to enter the system. The affected customers were sent replacement components at no expense to them. "The actual source of the problem is that the meters are multi piece, then assembled instead of being a solid CNC'd machined piece." This is false. The multi-piece Aeros MAF housing design produces a leak-proof seal. The MAF housing has been leak-proof since April, 2011. The SURE Motorsports multi-piece MAF housing design and assembly process produces a leak-proof product. The multi-piece CNC (computer numerical control) machined design allows SURE Motorsports to achieve highly accurate tolerances and significant results in performance and tuning. A solid, single-piece, CNC machined MAF housing unit is not available to the Mazda performance market at this time by any vendor. "These are not pressure checked at all." SURE Motorsports Aeros MAF housings are guaranteed to be leak-proof. Each product is inspected and approved by a minimum of three qualified technicians during quality control. Kevin Pugh's statement is made without knowledge of the SURE Motorsports testing and assembly procedures. Kevin Pugh presents no evidence to support his claim. "Both long term and short term fuel trims were all over the place until this issue was addressed with a V2 version. Toward the bottom are some videos outlining the issue from one of our members." The SURE0100 (discontinued) Aeros Intake System performed correctly on 2006-2007 Mazdaspeed 6 and 2007-2009 Mazdaspeed 3 vehicles. Fuel trim values caused check engine lights on some 2010 Mazdaspeed 3 vehicles. (a, b) The affected customers with o-ring issues were sent replacement components at no expense to them. (c) The release of the 2010 Mazdaspeed 3 included new fuel trim values for the Check Engine Light (CEL) threshold. This change sometimes resulted in a CEL with the use of SURE0100 (discontinued), more commonly when used in colder climates. (c) There have been several revisions to both SURE0100 (discontinued) and SURE0113 (current model) Aeros Intake Systems. SURE Motorsports does not use the term “V2 version” for any model Aeros Intake System. The SURE0113 (current model) Aeros Intake System (referred to as the “V2 version” by Kevin Pugh), was most notably revised for compatibility with the 2010-2013 Mazdaspeed 3 vehicles. (c) The affected customers with 2010 Mazdaspeed 3 vehicles were upgraded to the new SURE0113 (current model) Aeros Intake System at no charge. "Not to much of a big deal here, considering it was simply an intake and SURE was able to address this issue pretty quickly. If anything, it just made driveability crappy. " The few customers affected by Aeros issues (a), (b), & (c) were sent replacement components at no expense to them. SURE Motorsports guarantees the entire product line to be free of Check Engine Lights (CEL). "It could have adverse affects for higher horsepower guys by causing the tune to go off the charts, creating a lean condition. We didn't see anyone blow an engine or experience any mechanical failures from it thank god." To achieve high-horsepower (300hp+) on a Mazdaspeed vehicle, the factory Engine Control Unit (ECU) must be custom tuned with an aftermarket tuning device. (c) With custom tuning, both SURE0100 (discontinued) and SURE0113 (current model) Aeros Intake Systems would be compatible with the 2006-2007 Mazdaspeed 6, 2007-2009 Mazdaspeed 3, and the 2010-2013 Mazdaspeed 3 vehicles. (c) The SURE0100 (discontinued) Aeros Intake System has a larger diameter than the SURE0113 (current model) Aeros Intake System. With a custom tune, the larger diameter is capable of yielding higher horsepower. The custom tune would not “go off the charts” or create “a lean condition” because the vehicle has been custom tuned for the larger diameter of the SURE0100 (discontinued) Aeros Intake System. (a, b) The affected customers that experienced unaccounted airflow caused by o-ring issues were sent replacement components at no expense to them. O-ring issues could cause warnings such as a CEL, hesitation, fuel cut, and/or other irregular conditions on any Mazdaspeed vehicle, with or without a custom tune. SURE Motorsports Advanced Development products require custom tuning. "After all, Mark was still working there at the time. Mark was truly a standup guy behind both SU/SURE, therefore, you knew any issues would immediately be taken care of." Mark S. was employed from October, 2007, to September, 2012. In addition to his product development and engineering role, he also handled communications with mazdaspeedforums.org. Cullen Mariacher, owner of SURE Motorsports, oversaw these communications. 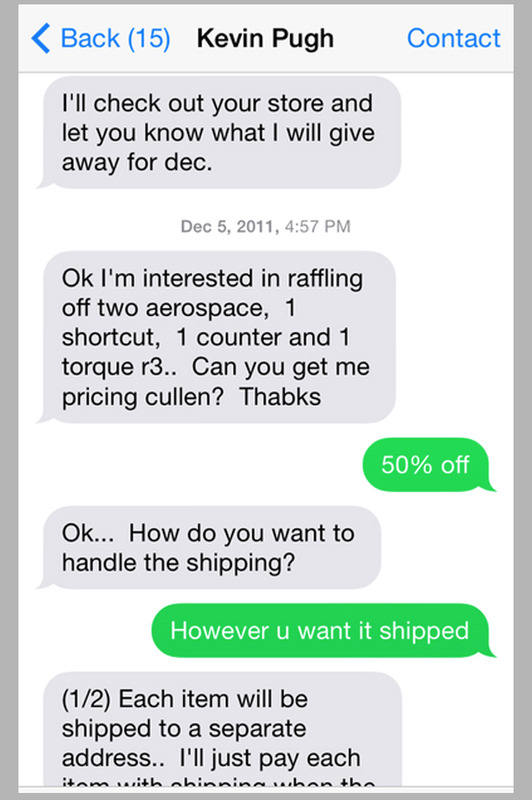 "Dealing with Mark was much easier than dealing with Cullen on any given day. Cullen would immediately go on the defense or deny an issue is much more serious than it really is." Upon Mark S.'s departure from SURE Motorsports, Cullen Mariacher, owner of SURE Motorsports, began communicating directly with Kevin Pugh (Haltech) regarding mazdaspeedforums.org, amongst other topics. 1. "Everytime i talk to Cullen (CEO of SURE), i always sense his passion about Mazda's. He is a huge supporter of Mazda enthusiast events, forums and promoting the Mazda brand. Another unique aspect of SURE is how they treat customers and stand behind everything they sale, no matter what it's cost is. It's rare these days to see companies really striving to be the best and beat their goals the previous year." "Their customer service was decent at this time, so people did get their replacements and all seemed to be forgotten. Its not unusual for minor flaws to show up once the masses begin to purchase them. However, a properly engineered part won't have any issues to begin with, so.... take it for what its worth." SURE Motorsports offers a lifetime warranty policy on all of its products, and communicates with customers in person and via telephone, email, social media, Mazda forums, and SUREHQ.com. 1. "From design, to packaging to customer service, SURE has placed a lot of pressure on competitors to do it right the first time. SURE is extremely passionate about its dedication to providing the best performance parts for Mazdas's." "Another unique aspect of SURE is how they treat customers and stand behind everything they sale, no matter what it's cost is. It's rare these days to see companies really striving to be the best and beat their goals the previous year." "Quite a few people began to report PO171 codes.. which is a running lean code." In 2011, an estimated 6 customers with 2010 Mazdaspeed 3 vehicles experienced a P0171 code. SURE Motorsports upgraded these customers to the new Aeros Intake System at no charge (SURE0113 - Current Model). The four videos referenced by Kevin Pugh are from one 2010 Mazdaspeed 3. Incidences of erratic fuel trims affected a small number of generation 2, 2010 Mazdaspeed 3 vehicles. want to measure my fuel trims." This is false. The forum links provided by Kevin Pugh do not contain any first-hand reports of issues with the Aeros Intake Systems. These links show general discussion of the Aeros Intake System. Some users reference threads found on mazdaspeedforums.org. No user reports having an issue themselves. "SURE thought the inside diameter of the airbox where the MAF housing sits was off between different generation MS3's were the initial cause." This is true. The factory airbox MAF sensor housing diameters differ between the 2006-2007 Mazdaspeed 6, the 2007-2009 Mazdaspeed 3, and the 2010-2013 Mazdaspeed 3. A random sampling shows factory airbox MAF sensor housing diameters range from 2.670'' to 2.690'', +/- .005. "While true to a degree, Mazda was having some issues where their MSCAI was to blame for blowing up Gen2 ms3's. The Long term fuel trims were very high and causing lean conditions on the car at high loads. A simple firmware flash seemed to fix trim issues after their MSCAI had an airfoil installed." The known issues associated with the Mazdaspeed brand cold air intake system are not related to the Aeros Intake System. These two intake systems bear no resemblance to each other in design or performance. "However, for SURE's intake, it wouldn't matter as It came down to assembly issues..."
Three issues (a), (b), & (c) have occurred with the Aeros Intake System between November, 2010 and April, 2011 (Reference 2.1). None of these issues are related to the issues of the Mazdaspeed brand cold air intake system (Reference 2.14). "When you make multi piece intakes, you introduce a host of problems when it comes down to sealing." All initial sealing issues of the SURE Motorsports MAF housing were resolved by April, 2011. The multi-piece design of the SURE Motorsports MAF housing has been leak-proof since April, 2011. "Add the fact these are anodized, and bam... you aren't going to have much success without sealing with some type of gasket." The design and assembly of the SURE Motorsports Aeros MAF housing is guaranteed to be leak-proof. SURE Motorsports anodizes all aluminum components of the Aeros MAF Housing. The chemical process of anodizing adds .0005'', +/- .0005'' material in the form of oxidation to the surface of the aluminum. This process has no negative effect on the ability of the Aeros MAF housing to create and maintain a seal. Anodizing adds corrosion resistance and provides color options. The SURE Motorsports Aeros MAF housing includes an o-ring that seals the Aeros MAF housing to the Aeros MAF sensor mounting plate. The factory-issued MAF sensor includes an o-ring that seals to the Aeros MAF sensor mounting plate. During the assembly process, the use of Loctite 545 thread sealer is used on the four MAF sensor bracket bolts and on the two airflow straightener set screws. As of October, 2014 there are over 2,500 Aeros Intake Systems in the marketplace. The Aeros warranty rate is .008, which all occurred within the first six months of the product's release in 2010. "This right here should of been a big sign for SURE to acknowledge that better testing should be completed before releasing parts for mass purchase. A little warning gone ignored..."
The SURE Motorsports Aeros Intake Systems have been tested on numerous 2006-2013 Mazda vehicles. In addition, results of independent testing done by Kevin Pugh with the factory airbox were supplied to SURE Motorsports. Additional third-party testing continues on vehicles across the United States. Third-party testing provides SURE Motorsports with additional feedback following SURE Motorsports’ in-house product testing procedures. When Mazda released the 2010 Mazdaspeed 3, SURE Motorsports began testing the original SURE0100 Aeros on three 2010 Mazdaspeed 3 vehicles. The initial vehicle used for testing was a SURE Motorsports vehicle located in Central Florida. The second was a customer’s vehicle located in the colder climate of Maryland. The third was a customer’s vehicle located in the hot/dry climate of Texas. These test vehicles were in addition to the testing performed on the two 2006 Mazdaspeed 6’s, 2007 Mazdaspeed 6, two 2007 Mazdaspeed 3’s, and two 2009 Mazdaspeed 3’s. The three 2010 vehicles operated normally, producing no warning signs such as CELs, hesitation, fuel cuts, and/or other irregular conditions. Once other customers with 2010 Mazdaspeed 3 vehicles in different climates with different modifications began experiencing check engine lights, SURE Motorsports reevaluated the 2010 Mazdaspeed 3 Aeros application. A small percentage of 2010 Mazdaspeed 3 vehicles experienced a check engine light. The Maryland 2010 Mazdaspeed 3 test vehicle continued to operate with the original SURE0100 Aeros Intake System until October, 2013, at which time it was upgraded to SURE0113. The Texas 2010 Mazdaspeed 3 test vehicle continued to operate with the original SURE0100 Aeros Intake System as of October, 2014. SURE Motorsports maintains comprehensive testing procedures to ensure the highest-quality and safest products on the market. Each product is backed by the SURE Motorsports Lifetime Warranty. "Shortly after this issue, a V2 Aeros was released." The SURE0113 Aeros Intake System, referenced by Kevin Pugh as the "V2," was released in April, 2011. This Aeros Intake System is compatible with the Mazdaspeed 6 (2006-2007), Mazdaspeed 3 (2007-2009), and Mazdaspeed 3 (2010-2013) vehicle models. There have been no warranty claims made for the SURE0113 Aeros Intake System.